In the aftermath of a natural disaster such as a hurricane or earthquake, victims could get more than temporary help if the structures erected to provide immediate relief could be easily converted into permanent structures. These converted repurposed buildings could become long-term housing, schools and clinics—or farm and light-industrial buildings. This six-page publication describes two different approaches to building canvas-covered, skeletal, light-timber frames to meet this need. 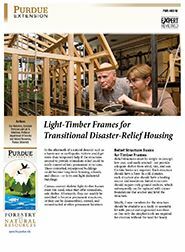 Light-Timber Frames for Transitional Disaster-Relief Housing is available as a free download at The Education Store.